The AgustaWestland A109S Grand is a light eight-seat twin-engine multi-purpose helicopter produced by the Italian manufacturer Agusta (today AgustaWestland). 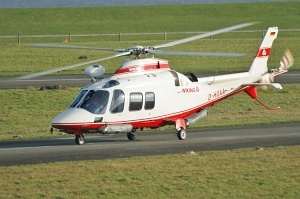 This helicopter type is mostly operated for passenger transport (executive also) and emergency medical service (EMS) by civil operators. The A109S is a further variant of the Agusta A109 with a larger fuselage. A109S is the official designation, Grand the commercial name.